Looks like the two URLs point to the same content, but it would be less confusing and an SEO advantage to redirect one to the other. I.e. going to newsgroup.xnview.com should to redirect the user to forum.xnview.com. I work at Google and I'm suggesting this because it would improve search rankings as well. Thank you for the heads-up, Dan! ... which puts radio buttons for the newsgroup and the forum sub-domain in Google's search form. Drahken wrote: Odd, since I'm currently ON newsgroup.xnview. Hi, Drahken. 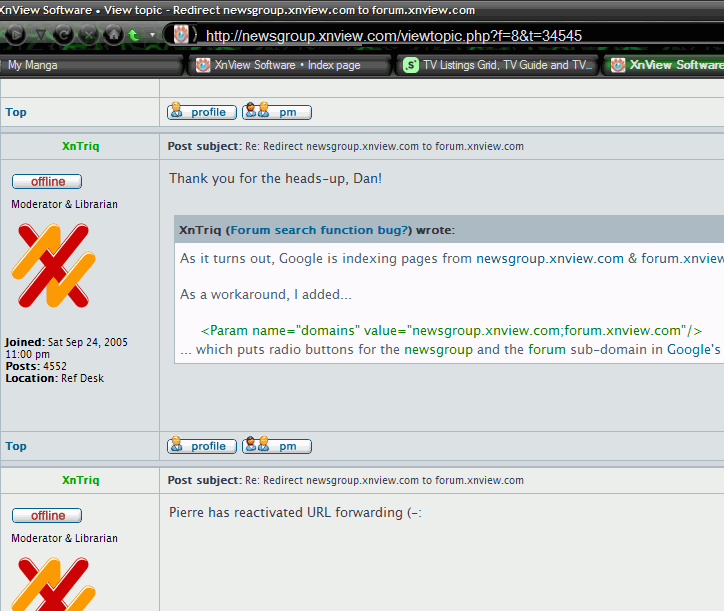 forum.xnview.com is redirected to newsgroup.xnview.com (not the other way around). OVH: How to create a free web redirection?